In the days when fairytales were first spun, they weren't the sweet and cheerful stories we tell today. Back then, fairytales were terrifying. They were a warning to the listener to stay out of the night, to keep away from the mystical and ignore the mysterious. Prepare to open a treasure box of the unusual and the macabre. 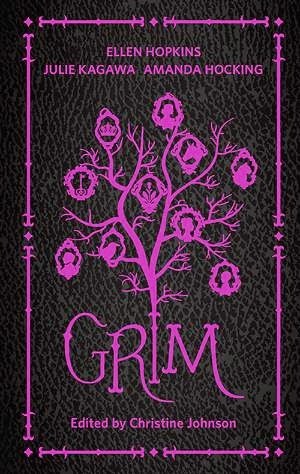 Grim is the ultimate compilation of mostly Harlequin Teen novelists, who have produced an anthology of the ultimate in dark fairy tales. Featuring seventeen stories by New York Times bestselling authors Ellen Hopkins, Amanda Hocking, Claudia Gray, Rachel Hawkins, Julie Kagawa, and others, each author has created a short story with the running theme of the dark and quirky. Some are heartwarming and quirky, and others are dark and morbid, but by far my favourite tale was Figment by author Jeri Smith Ready. Figment tells the story of Eli, and his estranged father who recently passed away. Eli is a budding musician, following in his father's footsteps. But what created his father's success now lays within Eli's hands, a small stuffed cat. It's incredibly cute and placed strategically as the second story within the anthology, from there the remaining stories become more twisted. The Raven Princess by Jon Skovron is a dark retelling of what could be described as a typical fairytale. A queen casting a spell on her infant child, only to turn into a raven and wander the Earth looking to break her spell. It isn't until seventeen years later when the princess finds a reluctant hunter, that she reveals the true meaning of the curse. He must meet her at a cottage where an elderly woman lies in wait to tempt the hunter. The princess can only be seen in her true form at midnight, and in order for the hunter to remain awake, he must avoid consuming anything the elderly lady has to offer. Easier said than done. From Kimberly Derting's modern day Hansel and Gretel, to Julie Kagawa's retelling of the Three Little Pigs, this compilation really does have something for everyone. The one awkward moment I found was the story by Myra McEntyre titled Skin Trade. This story wasn't only creepy, it's bordering on sickening. It tells the story of a group of musicians who find women within the crowds at their shows, take them home and skin them. It was disturbing, gruesome and if you're anything like me, skip this one. But the rest of the anthology is awesome. I've never been one for fairytales, but Grim is perfect for fans of the Splintered series or dark and eccentric fairytale retellings. I've never read anything of her's before, or heard of her before actually, but that story has completely turned me off. I don't think I'll pick up anything of hers until I'm able to flush this one from my memory. I am not a fan of the Splintered series but anthologies have always intrigued me so will keep this under my radar. It's one that you can pick up and put down pretty easily, so you can read it in drips and drabs. It's not for the faint of heart though, some of the stories are quite disturbing. Dark, sinister and some just down right disturbing. I really enjoyed it. Some of the fairy tales and children's stories I hadn't heard of before, I only wish they had provided a bit of backstory to the originals. I think you'll enjoy this one. I'm so glad you enjoyed this anthology as much as I did, Kelly! Yeah, Skin Trade was a disturbing one. What did you think of Beauty and the Chad lol? I knew you'd pop in to ask that, so I neglected to add that to my review. It was terrible, just so bad that I actually found myself laughing. It was so much better than Skin Trade, that was horrific. I've had this book but is saving it when the mood hits. I do like retellings but sometimes it can either infuriate me or it does the opposite. I do feel like I will like some of the stories here, because I like the dark and twisted versions of fairy tales. I wonder if I'd like Figment, too. Brilliant review, Kelly! Figment was adorable! It's supposedly a Puss In Boots retelling, but it's definitely the most heartwarming story in the compilation. Some of them were far too dark for me, but I just can't get over Skin Trade, my goodness. That's the great thing about this one, you can read a story whenever the mood strikes you. They're short and and easy to get through. Thrilled that you enjoyed so much too. Thanks for stopping by Faye. I had heard about the Skin Trade story and that sort of put me off. A bit too much for me to handle. But it's nice to know that it's only really the one story that's quite like that. Oh it's terrible Kate, but thankfully it's the only disturbing one in there. Lots of dark retellings but the rest are mild compared to Skin Trade. I recommend that most should skip over that one. I can't recall having read an anthology before this one, apart from Publisher samples and the short stories in 'Till the World Ends. I loved that I could pick it up and put it down with ease and didn't really need to keep my place. The only downside is that when you're really enjoy one particular story, there isn't enough of it. Thanks Zoe, looking forward to your thoughts when you get around to picking this one up. Thanks for popping by. Oh, I liked this anthology, too! I liked FIGMENT and H&G, and I liked the ending of The Raven Princess. I think I actually did skip over the McEntire one because it wasn't holding my interest--I was actually surprised when I read your review and saw what it was about, hah. Oh gosh Wendy, you dodged a bullet then. It was terrible! I'm really surprised it was included, it wasn't dark, just morbid. Figment was just adorable, now I need to find out where I can get me one of those little cats in the pimp hat. It's certainly darker Sunny, I think you'll really enjoy this one. It was up on Netgalley not too long ago, think it might be still available. I'd hop on and see if you can grab a free review copy, it's totally worth it even for the few standout stories.